I would whole-heartedly recommend this book to anyone who wishes to understand “how the brain makes up its mind”. 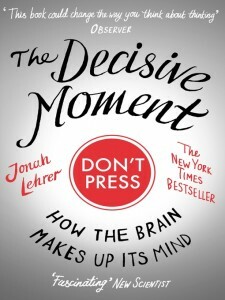 Jonah Lehrer tells compelling stories about real-life decision making situations in order to bring to life several fascinating insights into the tug-of-war that goes on between instinctive versus thoughtful aspects of every choice we make. Tales of firefighters, surgeons, consumers, poker players, financiers, sportsmen and pilots compellingly and efffectively reveal the differences between decision making scenarios where we should TRUST our instincts and others in which we should DISTRUST them. 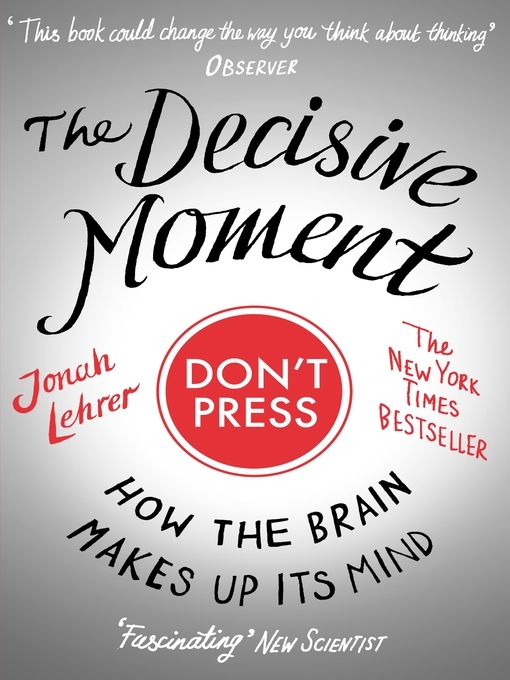 An extremely thorough, readable and up-to-date account of the latest research into what goes on in our brains during a wide variety of decision-making scenarios, from picking a favourite jam to making a snap decision on a course of action that may, or may not, avert imminent disaster. It reveals that even expert decision makers can be just as bad as novices because the trade-off between the two competing influences is usually imperfect. The pursuit of an optimal decision is often be tripped up by malevolent forces such as loss aversion, confirmation bias and overconfidence – leading to a reluctance to evaluate decision making errors – our only hope should we wish to improve our decision making strategies. By the end of this fantastic book the reader will have developed a solid understanding of how the cold, rational, analytical apects involved during conscious evaluation of the benefits in light of the associated risks for each option must wrestle with the hot, emotional, impulsive aspects of decision making (providing a window into subconscious processing of the relevant considerations). I have read a lot of popular science in recent months and have noticed that many authors have a tendancy to overuse scientific jargon, labour their point in overly-dense prose and/or try too hard to be funny. In stark contrast, I take my proverbial hat off to Jonah Lehrer – he nailed the tone and pace of this book perfectly – producing a truly great read!